“SNU College of Engineering announced on 10th that Professor Jang Wook Choi of the Department of Chemical and Biological Engineering with Professor J. Fraser Stoddart from Northwestern University, the recipient of 2016 Nobel Prize in Chemistry, teamed up for a joint-research to develop the next generation aluminum secondary battery system. The recent wide use of electricity-based transportation like the electric car and drone has called for a high demand of secondary batteries. However, the price rise of lithium and transition metals used in commercialized lithium ion batteries has led to an increase of cost burden along with the rise of demand. To overcome this limitation, the research team focused on aluminum, which is a much more affordable material with greater capacity. However, one critical fallback of aluminum ion is that it destroys the structure of most oxides; thus, finding a suiting rechargeable bipolar substance is difficult. Hence, the team departed from the conventional oxides to turn toward stable organic substance that hosts aluminum complex ions. The team was the first to reveal that two neighboring carbonyl groups within an organic small-molecule accept aluminum complex ions with stability. Furthermore, the team created a triangular organic molecule linking the ends of three organic molecules to prevent elution caused by organic small molecules forming specific crystals. This triangular organic molecule is of a flexible layered structure allowing itself to demonstrate over 5000 lifetime characteristics. In addition, the triangular organic molecule shares a similar structure with graphite; thus they can be laminated from each other. 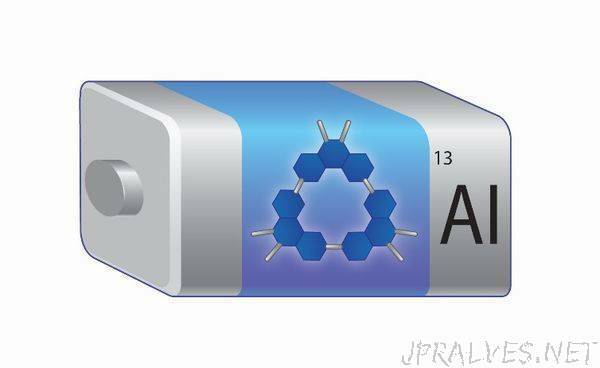 The laminated composite electrodes not only resolve the low conductivity of organic molecules, but also raise the energy density by simultaneously accepting two types of aluminum complex ions. Lamination with graphite maintains close contact between matters during drying, mounts high electrodes, and allows the use of existing processing lines; therefore, a huge advantage when it comes to commercialization.